BELLE PLAINE, Kan. (AP) - Wind gusts of up to 40 mph whipped western Kansas on Tuesday as cattleman Jerry Byrd drove his pickup back and forth between his home and the pens a mile away where dozens of his pregnant cows were waiting in frigid temperatures to give birth. The snow on was only an inch or so deep, but Byrd was keeping a close watch because the cold could kill a wet, newborn calf. Without space to bring all the pregnant animals in at once, Byrd was keeping them close to his son's barn. A rock wall and trees provided shelter, and he had birthing stalls ready for any animal that seemed about to give birth. His son too was keeping watch over the animals about to have their first calves, checking them every two hours, day and night. "When it gets this cold you have to check them, you have to bring them into the barn," said Byrd, who lives in Dighton. "They have good protection, but the wind chill is 36 below zero." The winter storm that paralyzed cities across the Midwest has made life harder for exhausted ranchers like Byrd. Even those whose cows aren't ready to give birth have been busy trying to keep their water from freezing, putting out extra rations to make sure the animals maintain their weight and watching for signs of frostbite. Feedlots in the Texas Panhandle lost cattle several years ago when temperatures plummeted unexpectedly. The animals "just flat froze, standing in the lot," said Bill Hyman, executive director of the Independent Cattlemen's Association in Texas. While widespread deaths aren't common, Hyman said it's not usual to lose some animals to frostbite or freezing. In 2007, more than 1,000 cattle died during a winter storm that struck 44 Kansas counties that were home to 3.7 million cows. 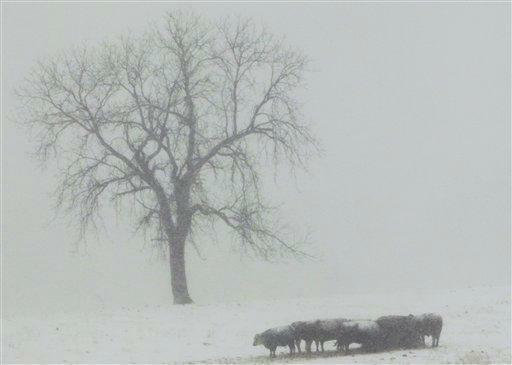 That's one reason preparations for this week's blizzard started long before the storm hit Terry Handke's feedlot in Muscotah in northeast Kansas. Workers put chains on the wheels of the feed truck and loader so they wouldn't get stuck in snowdrifts while tending to the several thousand cattle on the lot. Hanke said he didn't expect to lose any animals to the storm but it would cost him quite a bit of money. Cattle consume more feed in severe cold and can still lose weight as they struggle to maintain their body temperatures. "Some of these cattle eat $3 to $4 a day of feed," Handke said. "If they are not gaining, you are talking big dollars real fast." Outside Conway in central Arkansas, temperatures were expected to drop into the teens and lower for the next few nights. Rancher Bill Wallace said his cows tend to be fine in cold weather because they're "just like a big fermentation vat." "All the feed that goes into them kind of rolls around and ferments and puts out a lot of heat," Wallace said. Calves, however, are another story. He had one cow give birth a few days ago when the temperature was milder and hoped the others would hold off until after the storm passed. "A cow having a calf during that period of time, if it's not sheltered, you might see a calf's ears freeze off," Wallace said. "There's not a lot of circulation in a calf's ears." Rancher Ken Grecian moved his cows from an open field to one with more trees for shelter and began giving them extra feed when he heard the weather forecast. A good area where trees provide shelter from the wind is better for adult animals than putting them in a barn, where humidity and condensation can cause other problems, he said. The biggest challenge Tuesday, Grecian said, was keeping the animals water from freezing. He put heaters in the water tanks and has been checking the cattle that drink from running streams to make sure they have an open space in the ice where they can get to the water. "The other thing when it is this cold, you find all the weaknesses in your machinery that you feed with. Things just don't work as well as they should when it's cold," said Grecian, who woke up Tuesday morning to find he had no water in his house in Palco, Kan., after the pipes in his well froze. The temperature on his farm was minus 10 degrees, with winds of 35 mph. Dale Spencer said the temperature dropped to about zero Tuesday on his ranch in the Nebraska Sandhills near Brewster. His roughly 600 cattle were handling the cold OK, he said, but the same couldn't be said for his tractor or the furnace in his house. Spencer said he had to drive 70 miles Monday to pick up a new water pump that he installed in the tractor Tuesday afternoon while waiting for a furnace repairman to arrive. The National Weather Service warned that wind chills in central Nebraska could drop as low as 40 degrees below zero overnight Tuesday into Wednesday. Spencer said he expected to be working from sunrise to sunset to keep things going. "It's not a lot of fun," he said, "but it's a task we take on because it's part of the job." Associated Press writers Tom Parsons in Little Rock, Ark. ; Paul Weber in San Antonio, Texas; and Josh Funk in Omaha, Neb., contributed to this report.